How many times have you come back from winter camping and in the process of relating your story been forced to say things like “Well, it was cold. It was 10 degrees in the valley, so I’m sure it was below zero up on the mountaintop, where we were.” It is not so satisfying, is it? Wouldn’t you like something a little more exact? But, considering the demands of the winter campout, you don’t exactly want to bring a mercury-type thermometer and have to write down the temperature at intervals. Especially when the most interesting time to take the temperature is probably in the middle of the night, when you have much more important things to do, like stay in your sleeping bag. Well, even if you have never been troubled by this problem, I have been. After this past winter’s campout, I was pretty disappointed that the best I could do for the answer to the “How cold was it?” question was say: “Well, my dad said it was 2 degrees outside his house down in the valley when he woke up.” I wanted to know exactly how cold was it overnight where we where. I think it was colder, but how do I know? Also, I only had one temperature point to go off of: 2 degrees. What about the rest of the time? We were out there for two days. From my days of undergraduate physics I know that dataloggers exist and I suspected that there existed one that would meet my needs, which was a simple device that would automatically record the temperature at intervals and save it to later be downloaded to a computer. I recently found one such device: the Lascar EL USB-2. Indeed I think that it meets and exceeds all of the requirements that I could come up with. The Lascar Easy Logger USB 2 is a small digital datalogger that records not only temperature, but also, as a bonus, relative humidity.1 The temperature range that it covers is from -31 to 176 degrees Fahrenheit, which is the range I would normally expect to encounter whilst camping. It is waterproof and has a very compact, minimal design with no buttons, so it should be durable enough to withstand the trials of winter camping. It has a long battery life of one year and it can store 16,382 measurements. At measurement intervals of one minute this means it will record for almost eleven and a half days. It is operated entirely through a computer interface which is very straight forward. There, one can set the measurement interval (every 10 seconds up to a half day intervals at specific intervals), the time when it will start (immediately or some preset time), and various alarms (like high or low temperature alarms; I don’t yet think I have much use for this functionality). So, basically you plug the thing into your computer’s USB port, do a quick setup, and go off recording. When you are done, you plug it back in and it the software will display a nice graph. I took it to Tahoe with me over the weekend. You can click on the image to enlarge it. I annotated a few major portions of the graph. The first night I left the datalogger outside in my truck. The temperature in the truck seems to have steadily declined until reaching an “overnight” low, which occurred some time around 8 o’clock in the morning and was 34 degrees. The second night I had it inside our cabin. Again the low occurred at 8 in the morning and it was 58 degrees. My girlfriend had decided it was necessary to use a number of blankets whose combined loft easily exceeded the sleeping bag I used during winter camping. At some point in the middle of the second night I woke up rather overheated and threw off almost all of them. I can clearly point to the graph and show her now that since it was above 60 degrees Fahrenheit in the cabin we clearly did not need so much covering. Such are the dangers of winter cabining, I suppose. 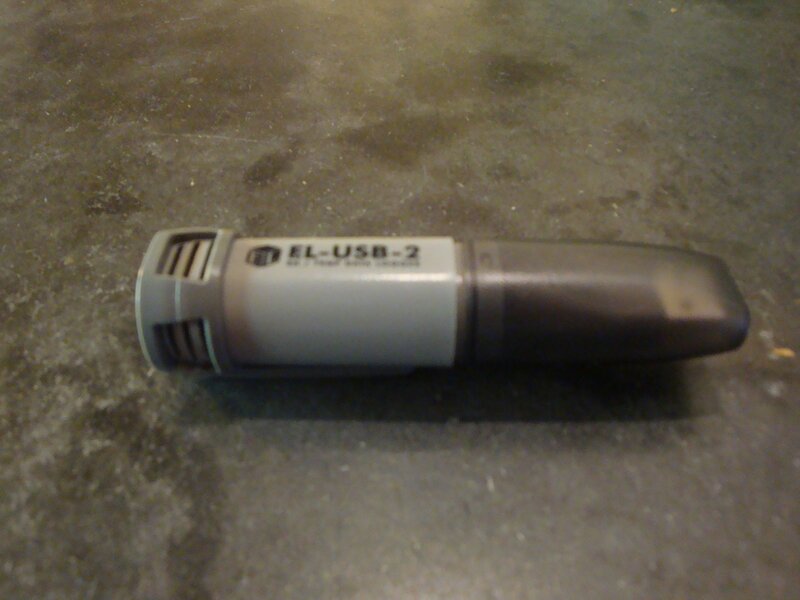 1 Lascar has a model, the EL USB-1, which takes only temperature but is otherwise the same. It is cheaper, but I thought having relative humidity might be interesting. One could investigate the effects of humidity on your camping experience, but that is probably subjective at best. 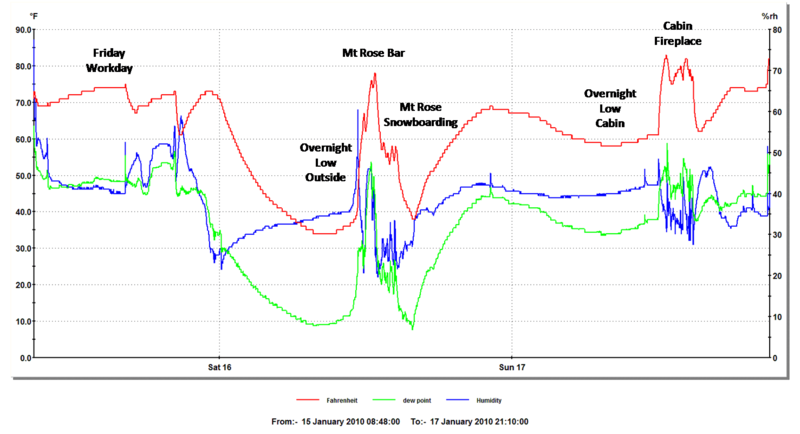 Temperature is probably the most interesting feature for logging camping conditions and so if one is more concerned about the cost than I was, I recommend the EL-1 for providing your camping datalogging needs.